Infosys founder N.R. 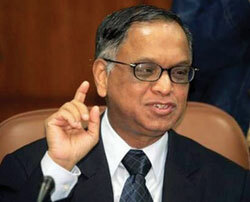 Narayana Murthy says that neither the Congress or the BJP is truly secular. Everybody has his own opinion about secularism. My question to Mr.Murthy et al, what is secularism. Secularism is a very shallow word in Indian context. The dictionary says secularism means a Philosophy or a doctrine that rejects religion and the attitude that religion should have no place in civil affairs. But Mr.Murthy should leave apart the political parties, the religion is deep rooted in our day to day affairs right from our homes to our offices Every year, every government and most private offices host a Pooja if it majority hindu and a Urs if it is majority muslim office. Taking the religion out of an Indian will mean taking the soul out of him. We are not so developed as the United States that we can proudly say that the religion is not a part of the state. Rather, it will be beneficial if we agree that the religion is a part and parcel of our Indianness. Secularism is the single most and oft abused word in India. People just say it without knowing the meaning or the wholeness of the world. So being secular essentially means to take out the religion out of the state. This is not possible in India, however the religious leanings of all political parties are evident from the way they conduct themselves. In this scenario I think that BJP is a better alternative because at least its Hindutva agenda is open. The Congress has over the years used its power to pander masses be it in Punjab, North East, Jammu & Kashmir or in Sri Lanka. India has had to fight the evil of terrorism because the Congress government at the centre supported all the above at one or another point of time to suit its own political needs. Everybody knows that the J & K elections of 1989 were rigged to make G.M.Shah the Chief Minister of the state against all the public opinion. It is this mistake that turned the tide of most pro India Kashmiris into anti India. It is this wound that is not healing but causing pain to us in many different ways. Be it a Jawan losing his life at the border or a Kashmiri youth losing his life to a army bullet or the gory massacre by the terrorists. In Punjab too, they supported and propped up Mr.Bhindranwale against the Akali Dal. Ultimately thousands lost lives for this mistake done by the Congress including Mrs.Indira Gandhi. Supporting the LTTE with arms and money by the Congress is known to all but ultimately it took a life a young and dynamic leader of India in the form of Rajiv Gandhi. There is a old adage which says what you sow so shall you reap. We have reaped enough hatred due to the ill implemented secularism (called the pseudo-secularism by intellectuals) by the Congress during its years in power. Now let us now make amends and choose one of the lesser evils of the two. It is a simple fact that India needs a single party Government at the centre to implement the reforms and usher in double digit growth. The alliances are a failed idea and only work in the breaking up of the nation. The regional parties come to the table with their own partisan regional agenda. This agenda has no place in Lok Sabha. The Lok Sabha is and will forever be for the India as a whole. To achieve this, we need a strong and dominant party in power and a equally strong opposition. This may seem odd but the I think Indians should give up on the third, fourth or the fifth front which often rises when the elections are due. Madam Jayalalitha and Mamata should know that Mulayam has never been a grateful and reliant partner. He is known to ditch even his best allies in the quest for power. We are in entering the decade of Asian powers and let us not waste our precious time discussing the merits of secularism. The BJP with its known agenda is always a better bet for the future of this country. However the BJP must also guarantee that no muslims or other minorities are harmed in any way and the Godhra was and will just be a aberation in the history of India. India can't bear for another Godhra to happen, to much was lost in the riots including lives, money and the mutual trust between the two communities. BJP should guarantee that this shall not be repeated in any form. The logic of Savarkar's Hindutva doesn't rely of imposing Hinduism on all but rather providing the Rajya Dharma or the rule of righteousness to all irrespective of their religion. If BJP can guarantee such a Rajya Dharma, then all the communities will benefit from the progress, as we were benefiting before the arrival of the Britishers and we attain our goal of being the 3rd biggest economy in the world. Read more about the affairs of politics in India here. "We are not so developed as the United States that we can proudly say that the religion is not a part of the state". Your argument lacked sensitivity the moment you said this. I am not pro-congress. I am not pro-BJP but I am sure anti-prejudice. First of all, its a nice thought to define secularism and how religion is inbred and amalgamated in our social fabric. But comparing that with US / AUS/ UK or any other nation is just plain stupid. This is one of the reasons why Indians in general struggle to get out of the corruption trap. They want the state to help them by comparing what other countries do. Their culture is different and so is ours. Our national identity and solution to problems is not looking upto other countries but learning from their mistakes. The bureaucracy in India, an evil of its own kind, lets not forget was taken from the English constitution. India needs a solution. But needs a solutions that works for it and not s solution that works for others and then force fit it in Indian context.